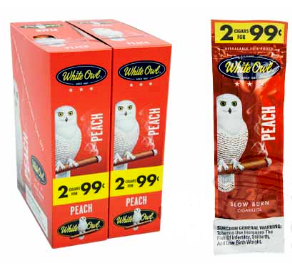 White Owl Peach 2 for 99¢ Cigarillos Cigars are well defined, short cigars wrapped in sheet tobacco. The filler is made with a blend of tobacco leaves from five different countries. The hints of peach flavorings further accentuate the flavor of the cigars. These machine-made White Owl Peach 2 for 99¢ Cigarillos are sweet to taste and have a mild smoke, the perfect combination for having a relaxed smoke, you can smoke them even when you are short on time. Come packaged in 30 packs of 2, in foil fresh pouches for guaranteed freshness.